The study, appearing in the October 2011 issue of the journal Human Organization, is a rare, but increasingly common kind of research that tried to match the "traditional knowledge" of people at the site -- hunters and village elders -- with scientific data. "They pretty much agreed," said Nicole Herman-Mercer of the USGS in Boulder, Co.
Herman-Mercer and Paul F. Schuster, also of USGS, along with Karonhiakt'tie Bryan Maracle of the Council of Athabascan Tribal Governments in Fort Yukon, traveled to two outlying villages in the Yukon Delta, St. Mary's and Pitka's Point, to interview the people on how their lives have been affected. Like most of the villages in the delta, the population is entirely Yup'ik Eskimos who have a subsistence-based lifestyle. The researchers interviewed 13 people, eight of them men. The number of subjects was small because of logistical and cultural difficulties, the researchers said, and they plan to go back. All of the subjects remarked that the weather has been warmer in recent years, most notably in the winter. Temperatures once commonly fell to minus 40 degrees F for days. Now if they sink that low, it is for shorter periods of time. The weather also has become less predictable, the men said, as well as more dangerous. The Yup'iks believe they could accurately predict the weather sometimes a week in advance by looking at the moon, but can no longer with any reliability, they said. This makes it more likely hunters would be caught out in the tundra when the weather changes for the worse, particularly in dark winter days. They also noted a decrease in precipitation, especially snow. The Yup’ik also saw a change in the populations of animals in the area, important to subsistence hunters. Ptarmigan and ducks have disappeared, while beaver and moose, not seen before in that part of the delta, are now common. According to lore, everything in Alaska moves east to west, so the Yup’iks are convinced the new species are coming in from the east, not just reproducing at greater rates. Flora also has changed, with salmonberries (berries that look like orange raspberries) smaller and harder to find, they said. Herman-Mercer said correlating what the hunters said with scientific studies wasn't solid because there are very little data on local areas that remote. Changes to the area's rivers are even more extreme. Frozen rivers are the highways that link communities in the winter and the ice is now almost half as thick as they remember it, making travel more difficult and considerably more dangerous. Breakup, the thunderous release of river water when the ice melts, now comes earlier in the spring and instead of a sudden, clamorous event, the ice just quietly melts.The rivers also contain much less driftwood, used by the villagers for heating, greatly upsetting the economics of living on the tundra. The USGS researchers said almost everything the Yup'iks were telling them matched what data exists. Since the average temperature in Alaska over the course of the year is at about the freezing point of water, warming by even a few degrees can completely alter life there. The average temperature in the area has increased by one degree C since 1966, and Arctic temperatures are now at a 400-year high. There is less snow and more rain. Researchers in other interior areas have found similar results. Yup'iks in Newtok, northeast of St. Mary's, are being forced to move upriver because changes to the river are now washing away their village. Evacuation of 400 people has begun at a cost that could reach $100 million. "Indigenous knowledge and scientific research must work in concert to further understand specific climate change impacts in specific locations in order to develop appropriate adaptation strategies," the researchers wrote. 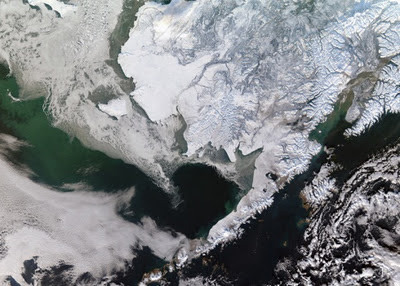 Craig Gerlach of the Alaska Center for Climate Assessment and Policy at the University of Alaska Fairbanks said local lore was valuable to scientists because the lives of the native population in the upper latitudes is intricately linked with the climate, weather and ecosystem. "Unexpected changes and unprecedented environmental conditions are easily noticed," Gerlach said. What the USGS survey found matches what scientists know is happening elsewhere. Joel Shurkin is a freelance writer based in Baltimore. He is the author of nine books on science and the history of science.